Is there a single sub-genre of horror right now that has been more overdone than zombies? I do not make this statement lightly as it was George Romero’s Night of the Living Dead that drew me into horror in the first place. Lately, however, zombies have just been told from every possible angle and story arch possible until it seems like there is nothing left to be said about the living dead. Perhaps that is not entirely true. In his visceral feast The Way of All Flesh, Tim Waggoner proves that there is some life left in zombies. “In a world where zombies battle the living, which is more terrifying? David is trapped in a nightmarish version of his hometown, pursued by crimson-eyed demons and insane cannibals, with no idea how he got there. At every turn he’s taunted by a mysterious youth named Simon who knows far more than he lets on. David’s sister, Kate, fights for survival in a word decimated by flesh-eating zombies—and her brother’s one of them. She’s determined to put a bullet in David’s brain to set him free. The synopsis of this book tells you exactly why you are about to experience one of the few fresh takes on zombies in the last decade. The Way of the Flesh shifts between three different viewpoints throughout the story. We see two survivors, one who is a sociopathic killer and another who is just trying to make it in a post-apocalyptic world. This in itself is not that unique. What truly stands out about this book is the perspective of David, a zombie. Waggoner does an astounding job in fleshing out the characters to make them seem to jump right off the page. While many authors are able to do this, other than the classic tale Frankenstein, I fail to come up with any examples in literary history where the author makes us feel so conflicted about simultaneously empathizing with the creature and hoping that he fails in his quest because of what his success would mean to the other characters that we have come to care about. Oh, and make no mistake, you will feel the push and pull of those emotions constantly! If there is one thing Waggoner does not do in this novel, it is hold back. Waggoner proves what a master he is when it comes to delivering characters we desperately want to see succeed and then taking our breath away at the situations into which he throws them. Once the suspense starts pouring on, it does not let up. Waggoner fashions a literary clamp around our heart and just keeps tightening it until it bursts. The action is constant with only enough lulls to allow us to connect even more deeply with the characters and draw us into the mystery of what is going on in his zombie-infected world. Nothing is too horrifying for Waggoner to address in this novel. Overall, I cannot praise this book enough. Waggoner does a masterful job in crafting a tale of horror that will stay with you long after you have closed the back cover. 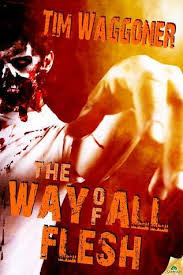 If you are a zombie fan, you owe it to yourself to read Tim Waggoner’s The Way of the Flesh. Overall – 4.86/5 – IF YOU READ ONE ZOMBIE BOOK THIS YEAR, MAKE THIS THE ONE!!! !